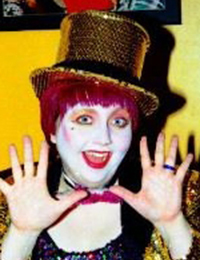 Amy “Eyelashes” Taylor has been in the Toronto Rocky Horror Shadow cast a mere 20 years. In addition to having played every role on stage and off she is the current cast Director. You will usually find her as the shows as Emcee or playing Columbia but she still enjoys occasionally sitting the audience and yelling out participation lines.